When Democrat senator Kamala Harris announced her run for the presidency, she vowed to be a “tireless advocate of men and women who lack power and wealth.” But Sen. Harris and her fellow Democrats are obsessed with removing power from We the People. Removing parents’ power to raise their children, Democrats implemented mandatory LGBTQ indoctrination in public schools. Parents are forbidden to opt out their child. 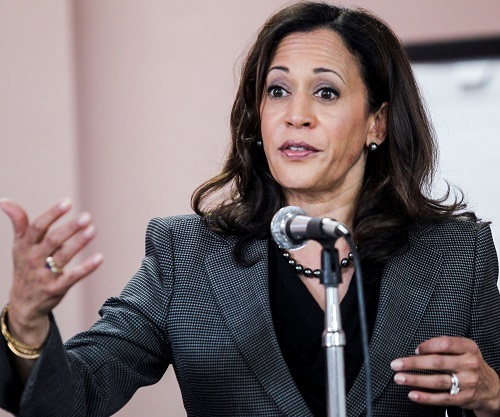 Sen. Harris and her party seek to remove more power from the people by disarming them. Students have been brainwashed into absurdly believing that law-abiding gun owners are responsible for school shootings. Democrats are pushing to lower the voting age to 16 so kids will naively vote to repeal their parents’ Second Amendment right to bear arms. Sen. Harris said that she will advocate for those who lack wealth. Between her party’s obsession with oppressive taxation and outrageously high death taxes, everyday Americans are blocked from acquiring wealth. “A good man leaves an inheritance to his children’s children.” (Proverbs 13:22) Democrats make this biblical principle impossible. Cruelly, they rush to confiscate and redistribute children’s inheritances. Children are forced to sell their parents’ life’s work (home and business) to pay the death taxes. Sen. Harris said, “I knew I wanted to protect people. And I knew that the people in our society who are most often targeted by predators are also most often the voiceless and the vulnerable.” This exposes Harris’ demeaning view of America and Americans. There are no masses of Americans supposedly targeted by predators. This is another Democratic tactic of creating an enemy which does not exist. Harris and her fellow Democratic presidential contenders are campaigning on their standard lowbrow rhetoric, creating victims and bogus enemies. They instill entitlement mindsets, class envy and hatred for the wealthy. Blacks have bought Democrats’ garbage for 50 years. Blacks are still suffering in poverty-stricken hellholes run by Democrats. In my late 20s, I became a born-again Christian. Excited, I visited prisons to share the good news of Jesus. To my surprise, most of the inmates were black. Many were gifted and talented. Their major hindrance was negative attitudes, hopelessness, victim and entitlement mindsets. Many thought, “Whitey is gonna stop me, so why even try.” Who filled these young black men’s heads with such destructive nonsense? The answer is Democrats. America is the greatest land of opportunity on the planet for all who choose to pursue their dreams. Period. Here’s my parable illustrating capitalism v. socialism. Mary and I celebrated our 40th wedding anniversary over dinner. Our waiter was fantastic, enthusiastically going the extra mile to make our special occasion truly special. I rewarded him with a generous tip. Capitalism allows our waiter to pocket my tip, giving him the incentive to increase his waiting skills. Socialism would require him to put my tip into a jar to be distributed between all the waiters at the end of the shift. So, slacker waiter Randy who takes excessive smoke breaks, repeatedly monitors his phone, and screws up food orders would get the same amount of tip money as my excellent waiter. This is the demoralizing consequence of socialism. Every Democratic presidential contender signed on to Alexandria Ocasio-Cortez’s Green New Deal, which mandates that in 10 years, we must end air travel, stop using fossil fuels, every new job must be unionized, nuclear plants must be closed, and every building must be rebuilt for state-of-the-art energy efficiency. Ocasio-Cortez’s deal also demands that deadbeats receive government funding. Each Democratic presidential contender emits a foul odor of arrogance and superiority. They believe they are our betters, extremely qualified to dictate how we should think and live our lives. Contrary to Sen. Harris’ presidential announcement speech, she and her fellow Democrats seek to remove our power by repealing our constitutional rights and block us from acquiring wealth. We are far better, much smarter, and much stronger than Democratic presidential contenders think we are. We are Americans.